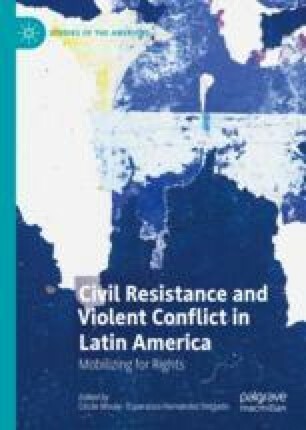 This chapter explores the nonviolent efforts by residents of the Colombian municipality of Samaniego to limit armed actors’ abuses. Civilians in this locality engaged in a process of noncooperation, refusing to collaborate with all warring parties present in their territory. We analyse this process using a typology of three forms of noncooperation—unilateral, pacted and oblique—and argue that, at the macro level, this case can be considered one of pacted noncooperation as it combined civil resistance with negotiation. However, when looking within the case and exploring its evolution, we find that the population complemented and reinforced this strategy with oblique and unilateral tactics. This combination helped civilians to sustain and strengthen their noncooperation efforts. By engaging in careful within-case analysis, this chapter provides a nuanced understanding of the Samaniego campaign and shows that types of noncooperation are not fixed over time and tactics are not mutually exclusive. We thank our interviewees for sharing with us many valuable insights and are grateful for the generous support provided by FLACSO Ecuador for the three research projects that allowed us to collect our data for this chapter. We presented a previous version of this chapter at the 2018 Annual Convention of the International Studies Association (ISA) in San Francisco and the 2018 FLACSO-ISA Conference in Quito. We thank participants and, in particular, our discussants Sebastián Bitar, Oliver Kaplan and Pedro Valenzuela, for useful comments. Parra, Dison. 1998, January 24. Samaniego pide callar los cañones, El Tiempo. Accessed http://www.eltiempo.com/archivo/documento/MAM-766813.